XPO Logistics Inc. reported on May 2 that its first-quarter results vaulted more than 100%, stemming from the heightened demand from domestic freight and last-mile delivery. Adjusted net income was $80.9 million, or 61 cents per share, up 113% from $37.9 million, or 30 cents, from the same quarter a year ago. Revenue jumped 18% to $4.2 billion from $3.5 billion. Analysts estimated revenue of $3.9 billion and earnings per share of 50 cents. The transportation segment generated revenue of $2.8 billion, a rise of 16% from $2.4 billion, while operating income rose 32% to $139 million from $105.3 million. The improvements were attributed to increases in freight brokerage and last-mile in North America, dedicated truckload transportation in Europe and favorable foreign exchange rates. Is XPO Logistics the most Amazon-like company in the transportation and Logistics industry? If not, who is your pick? The logistics segment reported revenue of $1.4 billion, a 23% rise from $1.2 billion in the first quarter of 2017. The rise was due to strong global demand for e-commerce contract logistics, along with gains from the U.S. industrial sector and the European fashion sector. “We have $3.4 billion in the sales pipeline, and we saw $927 million in new business in the quarter,” CEO Bradley Jacobs told Transport Topics. Much of the strong sales come down to a focus on giving clients what they want. “Customer service is the essence of how a business should grow,” said Jacobs. That approach is core to Greenwich, Conn.-based XPO’s plan to invest $450 million this year in technology in four major categories — automation and robotics, visibility and customer service, the digital freight marketplace and data science. Many investors are applauding the move. XPO has grown its investment in tech from $114 million in 2015 to the nearly half-billion dollars this year, said Timothy Mulrooney, an analyst who covers the firm for William Blair. “XPO Logistics is disrupting the traditional supply chain with advanced technology and multimodal solutions, and will continue to take market share from incumbent transportation and logistics providers,” Mulrooney wrote in a note to clients in February. Some of XPO’s recently introduced services are designed to appeal to its major client groups. For merchants there’s XPO Direct, a shared-space approach to distribution that makes available its warehouses and last-mile hubs for product storage by brick-and-mortar retailers and e-commerce firms. XPO uses customer data analysis to determine the optimum site to place products to best meet consumer demand. Once a product is ordered, XPO will transport it to the customer through its various transportation services. “By using our physical network and analytics, we can see where the order is placed and fulfill it rapidly,” said Ashfaque Chowdhury, XPO’s president of supply chain for the Americas and Asia Pacific. He notes that XPO’s North American warehouse and distribution footprint puts goods within two-day delivery of more than 90% of the U.S. population. In essence, that timely delivery means “we are giving air-type service for ground rates,” said Chowdhury. 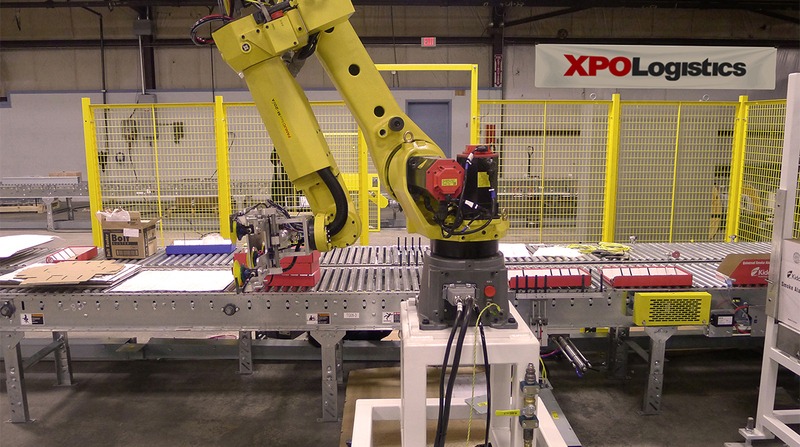 The company says that more than 100 warehouses and crossdocks are now XPO Direct-capable. For warehouse operators XPO in February introduced its next-generation, proprietary “WMX” technology for warehouse management. It’s a cloud-based, mobile software platform with multilingual capabilities designed to speed the deployment and integration of automation and robotics. Robots are seeing greater adoption as the technology gets more affordable, said XPO President Troy Cooper. That coincides with the rise of e-commerce leading to more peak volume days at warehouses due to special events, sales, clearances, and surges. “The industry goal is for 20-25% of labor to be conducted by robots,” said Cooper. To provide better visibility in the less-than-truckload arena, XPO began offering an application programming interface that gives customers real-time access to XPO’s internal shipping and rating systems. And last year the mobile app Drive XPO was launched to display load postings in real time with such details as origin, destination and freight type, and timing and requirements for special handling or equipment. It is designed for contract carriers and XPO’s own drivers. Jacobs, however, has two favorites among the tech initiatives. There’s C3-XPO, a site-security robot that closely resembles a Star Wars character, and there’s a voice-enabled last-mile program for consumers who use Amazon.com’s Alexa so they can track and modify deliveries without a click of the keyboard. XPO ranks No. 1 on the Transport Topics Top 50 list of Logistics Companies and No. 3 on the Transport Topics Top 100 list of the largest for-hire carriers in North America.